Cold winters are here and people often stay indoors as they feel there is not much to do outside. Contrary to popular belief winters are actually an ideal time for many activities, some indoors and many outdoors. Here are sixteen things that you can consider doing in NYC city in the coldest winter days. ​01. Walk around the city and the Central Park. What better time to explore the city on foot. Walk down the Madison avenue and you will get to see some stunning window displays of some of the high end fashion labels. 02. Explore Ditmas Park in Brooklyn for some of the most beautiful postcard like buildings and Victorian homes. ​03. 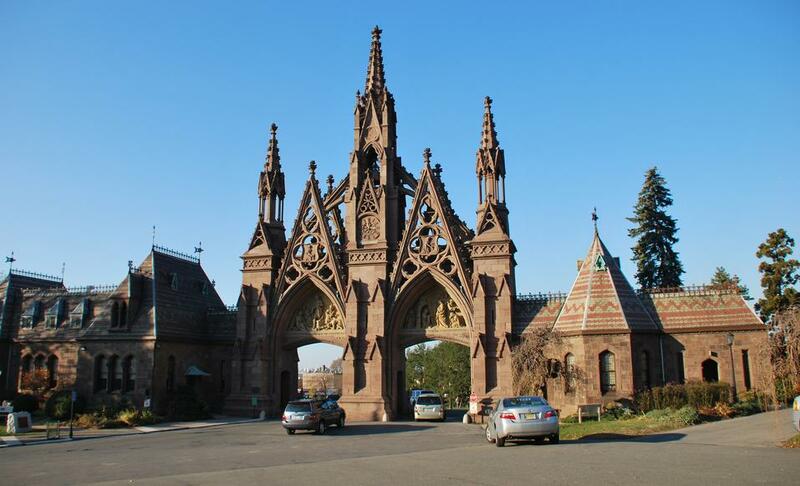 Explore the Greenwood Cemetery and then head towards the Brooklyn Bridge park from where you get to see the iconic Manhattan Skyline. An evening trip is great if you wish to take some stunning night photography. 5. Enter into Chinatown for a walk through an entirely different world. If you are tired this is the best place to get a foot massage or a full body massage for some unbelievable prices of $50 an hour and $75 for a 90 minute massage. You can even get some acupuncture therapy from licensed doctors. 06. After a massage it is a perfect time to shop for trinkets and some knick-knacks, you will find things like scarves, hats, trinkets and lovely jewelry for dirt cheap prices and best thing you can bargain for prices. 07. Once done, head down to Little Italy for some authentic Italian food , lovely desserts and some homemade Grappa. 08. 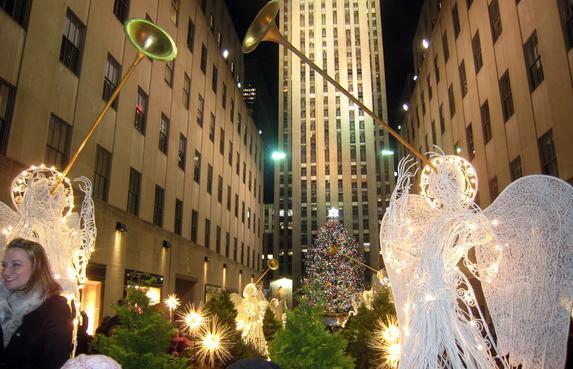 If you are into some winter sports head down to Rockefeller center for some Ice skating. Nearly all the people enjoy this activity immensely. 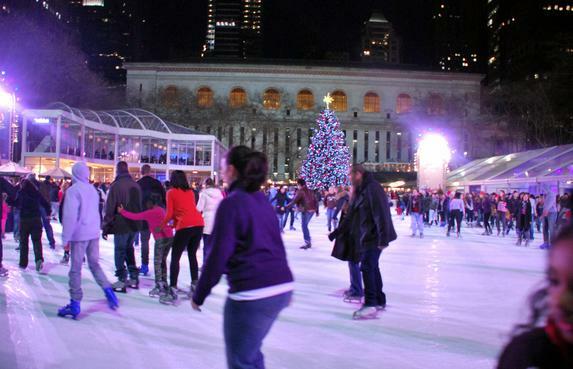 If Rockefeller center skating rink is crowded, Bryant Park skating rink provides an excellent alternative. ​ 09. Once done, head towards the famous Christmas tree and remember to get yourself photographed by a bystander or a professional and if everything fails, this is a perfect time to whip out your smartphone and take a selfie! 10. For people who are not so much into outdoor things, you can always spend many quality hours at The Metropolitan museum of Modern Art or the Guggenheim Museum . Tip :- Remember to travel light when visiting museums, they do not allow outside food and drinks. Only water is allowed and all backpacks & packages must be checked in (if you intend to go shopping do so after the museum trip). 11. You could go check out the latest Broadway Shows. There is always something interesting going on. 12. Check out Radio City hall for the Christmas Spectacular. 13. Walk down the Lower East side neighborhood and you will get to see a mish mash of Cafes, restaurants, pubs, small boutiques, family owned businesses, you can find some great bargains here. This was incidentally where the largest Jewish population in NYC lived a long time ago. 15. 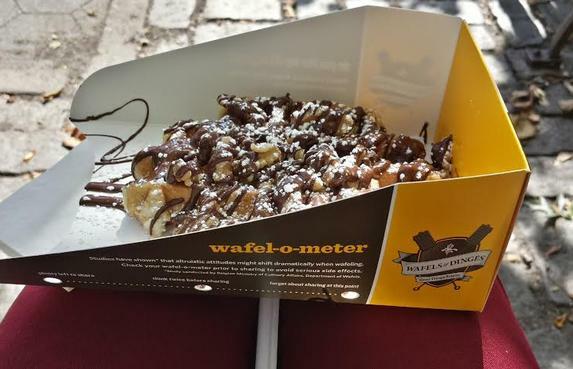 Remember to sample out foods from the food trucks you will find authentic world cuisines at a price that won’t hurt your budget or your health. The healthy juice trucks are a wonderful add to the existing food trucks. 16. Walk the Chelsea highline and end your trip in Chelsea market for some excellent cheese and fresh seafood for both cooked served by restaurants and raw.In a group or all by yourself, you will always find plenty of things to do in NYC in the winter time. Happy exploring.